It’s funny how certain foods or dishes can transport us to another time or place. When I was a kid my mom would make a version of this dish that I adored. I was a little odd when I was a kid because I love vegetables, especially spinach. 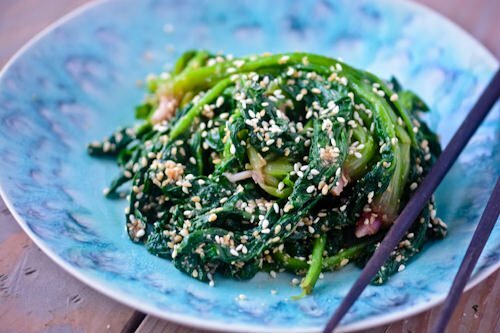 This is a super easy dish to put together and I bet even spinach haters will have a hard time turning their noses up at this one. The sugar is pretty critical to the dish, I’ve given an option to add maple syrup but I have to be honest I prefer the sugar in this case. 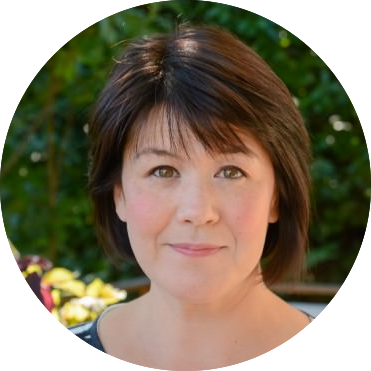 I know a lot of people are opposed to using sugar but when you look at traditional Japanese cuisine there is sugar in almost every recipe I know. I don’t mind using it because I know that I’m much more likely to eat and enjoy the dish and not feel deprived and look for something to treat myself with after I eat something “healthy”. It always surprises me when I talk to someone and they won’t eat parsnips or carrots because they have too much sugar in them when I know that they pound back peanut butter cups like they’re going out of style. Everything in moderation is the motto I like to live by, the second I say that something is forbidden I start to crave it like crazy. 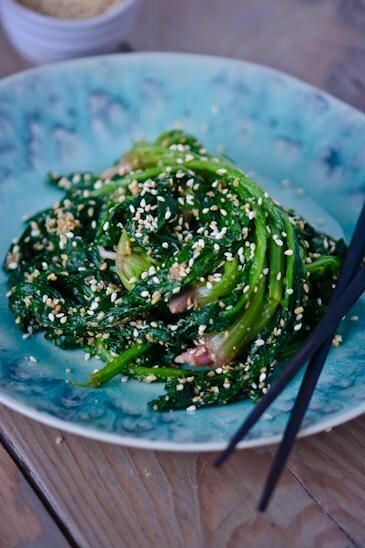 Anyway try the spinach, it’s delicious and it won’t leave you unsatisfied. Bring a large pot of generously salted water to a boil. Fill a bowl with ice water. 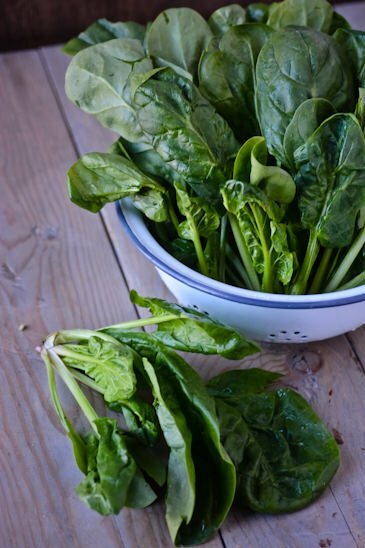 Blanch the spinach for 20 to 30 seconds in the boiling water and transfer to the ice water bath using tongs. Drain and gently squeeze out the excess water. Chop coarsely. Make the dressing. 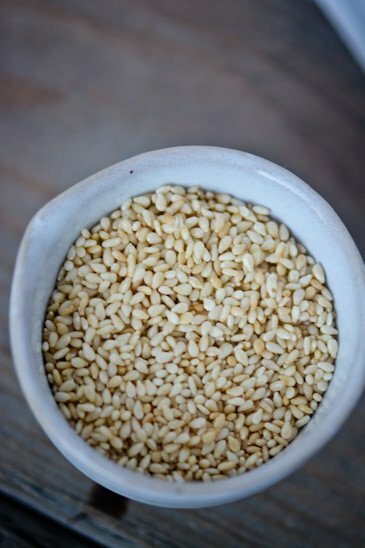 Toast your sesame seeds in a small skillet over medium heat shaking the pan constantly until the seeds turn light golden brown and smell nutty. 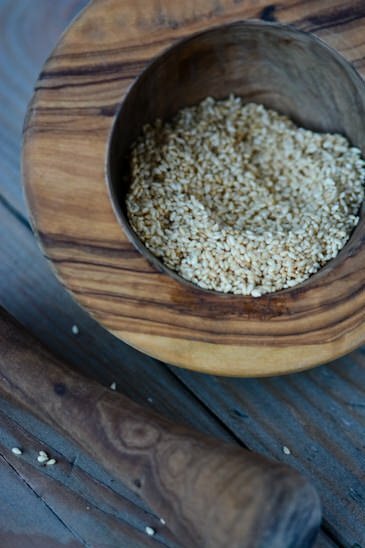 Transfer 2 tablespoons to a mortar and pestle or a spice mill reserving the rest for garnish. Allow to cool and then grind the seeds just until crushed. Combine the soy sauce and sugar or maple syrup in a small bowl and stir until the sugar has dissolved. Add the rice vinegar then stir in the sesame seeds. Toss the dressing with the spinach until it’s all lightly coated with the dressing. 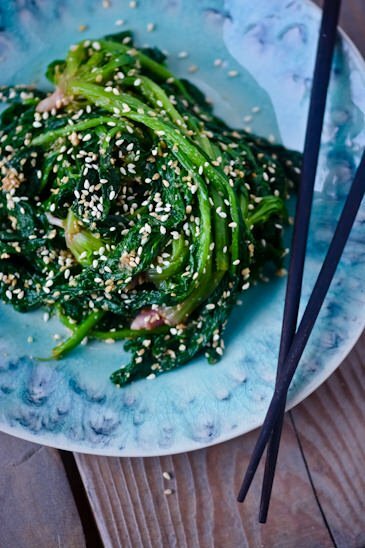 To serve drizzle with the sesame oil and reserved sesame seeds. Thanks for checking out the blog and the kind words. 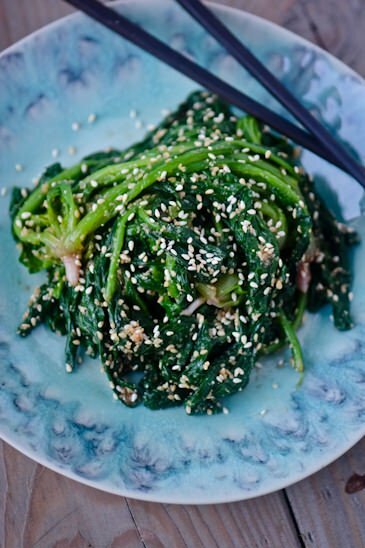 I’ve never had Korean sesame spinach before, I’ll make sure to check out your post! Tonight I made this and I think it’s the first time my boyfriend enjoyed spinach. Excellent for both of us! Thanks! I’m so glad you both enjoyed it. One of the reasons I started experimenting so much with different cooking techniques and flavors was to try and get my husband and son to eat more vegetables. One dish at a time is my motto! I made this and really enjoyed it! Spinach made right is SO good! !